Don't mind us, we're just over here waiting for the Easter Bunny. We're also snacking on our annual Easter dessert. There's no better way to celebrate than with a sugar coma. Right? We're also so blessed to be having a bright, shiny, and beautiful Easter weekend. That means we'll also be celebrating with some wonderful window whiffies. 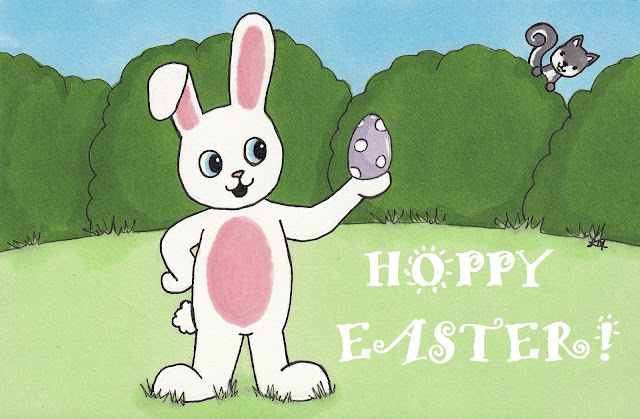 We hope you all have a blessed Easter, filled with everything that brings you joy! Today's tip is an Easter-inspired one, and it is to always think twice before ever giving anyone an animal as a gift. This could include giving a bunny to a child for Easter, as well as giving a puppy as a Christmas gift, or a kitty as a birthday gift. Caring for any animal will of course take time, effort, knowledge, and preparation. What's more, some animals, such as rabbits, have special dietary or other needs. This is why taking on an animal as a pet should be done with forethought and preparation by the pet's new owner. Giving a child a rabbit for Easter, therefore, could lead to a rabbit ending up in a situation with lack of proper care, and an overwhelmed child or parents. The same goes for giving any animal as a gift, especially if the recipient has not made the proper preparations or does not have the resources to care for a pet. So, never forget that giving an animal a proper home with proper care is something that should always be discussed, researched, and for which the owner should sufficiently be prepared. We have no doubt that all of you reading this already know this. The above being said, it's worth noting that if a responsible pet owner expresses a desire to receive a pet as a gift, that is a bit of a different story. Someone whom you know well, who is already a proven kind and caring pet owner, and who wants another animal, is someone who could more reasonably receive an animal as a gift. We bet there are plenty of wonderful pet owners out there who have received a best friend in this manner. The important thing is to think such a decision through wisely, and to consider whether an animal will for certain receive the proper care it needs from a potential recipient. 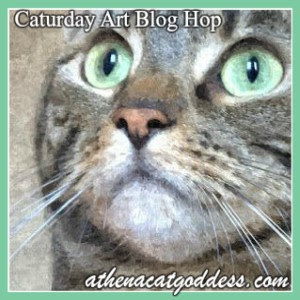 It's time for a mashup of the A to Z Challenge and Athena's Caturday Art Blog Hop. 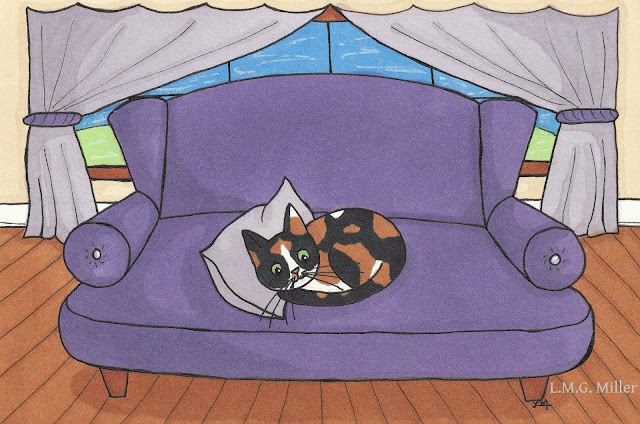 For this year's A to Z Challenge, our alphabetical series of doodles stars my angel Rosie. In these doodles, Rosie is going throughout a more or less routine sort of day, doing this and that, A to Z style. So, what's Rosie doing with the letter R? Throughout this A to Z Challenge, we're also going to do our best to share furbaby photos that in some way correlate with angel Rosie's daily alphabetical adventures. To go along with today's A to Z topic of Reading Time, both Evan and Thimble wanted to show off that they're regulars at the library. 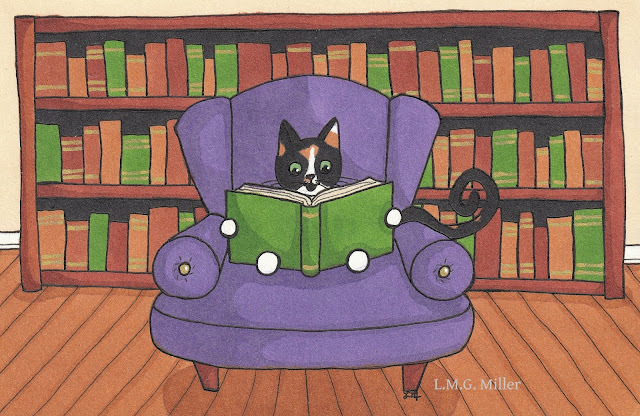 Wishing you all a happy Caturday filled with good books! 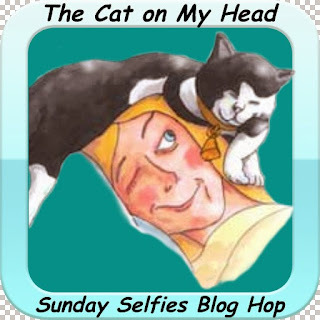 Today's tip is to consider the benefits that can result from reading to cats and dogs. This isn't necessarily something that we might think about, but reading to those kitties and pups can have more benefits than one. 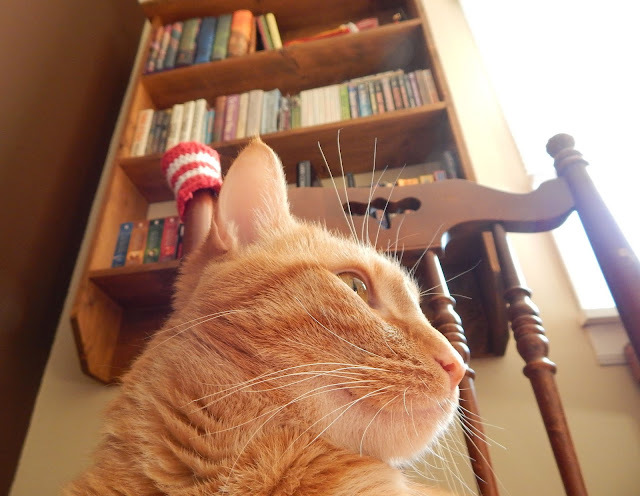 For example, if you adopt, foster, or in another way interact with a skittish cat or dog, reading to them in a calm, quiet voice can help them grow comfortable around you, while also helping you work through your reading list. You can also try to soothe or distract your cat or dog if they are scared by thunderstorms or fireworks by reading to them during these loud events. Then again, even if your kitty or pup isn't skittish or scared, reading to them can be a great way to bond, again while helping you get through some reading material. It's not just the kitties and pups who can benefit from a reading session, though. For example, reading to a cat or dog can help a child learn and practice their literacy skills. There are some animal shelters that even have programs in which children can come go the shelter to read to adoptable animals. This is beneficial in many ways, such as by giving the children practice in reading, while also giving the cat and dogs at the shelter attention and helping skittish ones become more comfortable around children or people in general. If this is something that interests you or a child you know, ask your local animals shelter if they offer such a program. Reading is a wonderful thing, furbabies are wonderful things, so perhaps consider combining the two. Ready for some Friday fun? 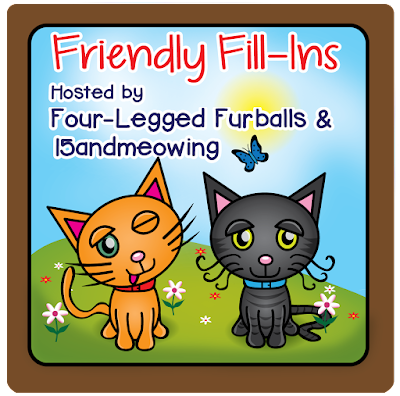 We're of course going to kick that off with the Friendly Fill-Ins challenge. In case you missed the fill-in statements yesterday, I'll share them again here. Ellen of 15andmeowing came up with the first two, and I came up with the second two. 1. An Easter (or Passover) memory that I have is _________. 2. I hope to purchase _________ this year. Here's how I filled in the fill-ins. My answers are in bold. 1. An Easter (or Passover) memory that I have is when one of my childhood Easter baskets included a squeaking dinosaur doll. 2. I hope to purchase very few non-necessities this year. 3. When the days are warm, I enjoy extra long walks with pup Astrid. 4. If the Easter Bunny visited my house, he'd have Eddy on his tail. Next up, we have today's installment of the A to Z Challenge. This time around, as many of you already know, our alphabetical series of doodles stars my angel Rosie. In this series of doodles, Rosie is going throughout a more or less routine sort of day, doing this and that, A to Z style. So, what's Rosie doing with the letter Q? (Is a bubble bath every really quick, though? Throughout this A to Z Challenge, we're also going to do our best to share furbaby photos that in some way correlate with angel Rosie's daily alphabetical adventures. To go along with today's A to Z topic of Quick Bubble Bath, Evan's here to show you how to take a proper bath. Isn't that a great lesson? Did you take notes? That's how you take a bath, and don't you forget it. Have a fun and fantastic Friday! Today's tip is indeed all about bathing those furbabies. Let's start with those kitties. In most cases, you will not need to give your cat a traditional bath as we know it. Helping your kitty remove unwanted fur can be done by brushing them, but an actual bath is often not needed for the kitties in our lives. A healthy cats is great at bathing itself with its tongue. If a cat needs a bath, such as one in the sink or the tub, it will likely be because they somehow got themselves dirty beyond their own repair, or they are in some way incapable of or unwilling to clean themselves and are in need of more extreme grooming. Such cases might include a sick cat with extreme diarrhea, or an unfortunate run-in with something along the lines of a skunk. 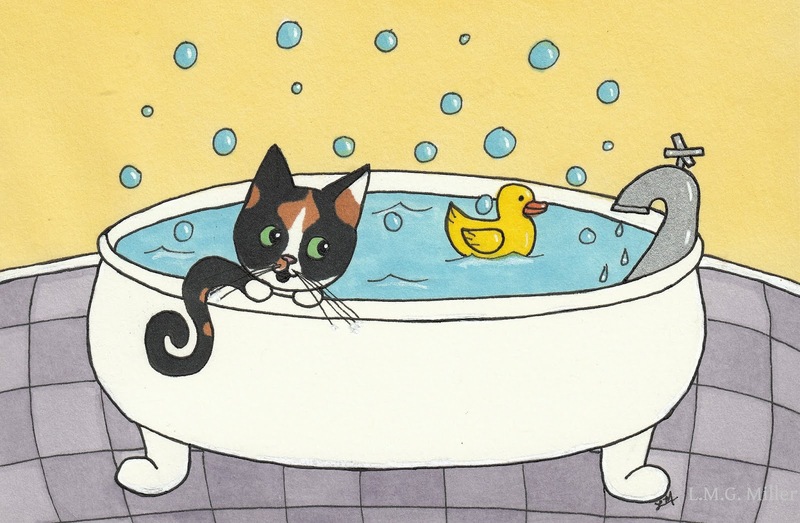 If such a bath is needed, seek out shampoo that is pet-friendly, bathe them carefully and gently, and of course monitor your kitty when there is a sink or tub filled with water. If professional grooming is needed, do your research for trusted groomers in your area, or ask your veterinarian if they offer grooming services. What about those dogs? Dogs are more often bathed by their humans, but do be sure not to bathe them more often than their skin and coat can handle. The frequency of necessary baths for dogs will depend on their particular coat, lifestyle, health status, and so forth. For example, dogs who play outside in dirt or mud, or dogs who have long hair that gets dirty easily, will likely require more frequent bathing and grooming than others. When it comes to bathing your pups, always keep an eye on your pup's coat and skin. If you are seeing lots of dry, flaking skin or dull, dry fur, then consider whether you might be bathing your pup too often. This is especially a concern during cold, dry winter months. Also make sure you are using proper, pet-friendly shampoo, and that you're regularly brushing your dog to keep the coat healthy outside of bath time. Just as with cats, if professional grooming is needed for your dog, do your research for trusted groomers in your area, or ask your veterinarian if they offer grooming services. Also speak to your veterinarian if you have any concerns about your kitty or pup's cleanliness, grooming habits, coat and skin, and so forth. Thursday is always filled with all sorts of fun, and we're kicking off that fun today with the A to Z Challenge. This time around, as many of you already know, our alphabetical series of doodles stars my angel Rosie. In this series of doodles, Rosie is going throughout a more or less routine sort of day, doing this and that, A to Z style. So, what's Rosie doing with the letter P? Throughout this A to Z Challenge, we're also going to do our best to share furbaby photos that in some way correlate with angel Rosie's daily alphabetical adventures. 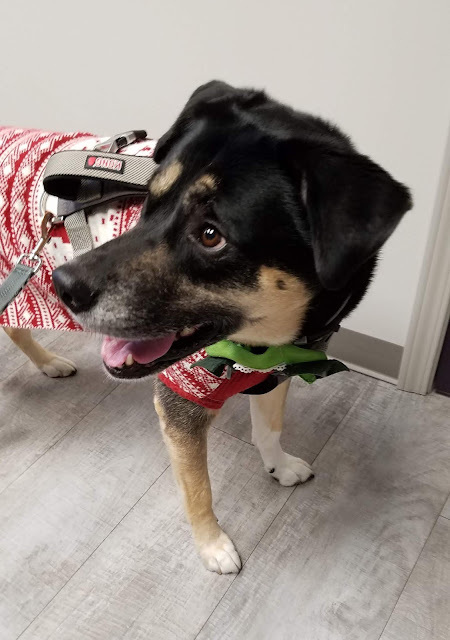 To go along with today's A to Z topic of Paying Bills, Astrid is sharing a festive flashback from a visit to the vet, one of the places where we pay lots of bills. Remember when we shared this around Christmastime? On this wintry day, Astrid went in for an inspection of a tiny little growth on her leg. It ended up just being a skin tag, but we wanted to be safe rather than sorry. Astrid had her toe removed due to a cancerous tumor a couple years ago, so any growths we find on her are checked by the vet. That all being said, we are so grateful for the wonderful veterinarians and entire staff at our veterinary clinic. They are so kind and good to the kitties and pup in our family. We'll happily pay those vet bills if it means the furbabies remain happy and healthy, and all under such wonderful care. On this Thankful Thursday, we are also so very grateful for all of you! Next up today is the always fun Thoroughly Poetic Thursday challenge, hosted by Angel Sammy. Even before I knew what the photo prompt was for this week, I told myself that I was going to try to let it guide me in creating an Easter-related poem. In addition, I also wanted my poem to go along with the A to Z Challenge letter of the day, that being P. I'm a masochist like that. But I digress. I was really quite glad when I saw the cute and fuzzy little guy in the image above. I could work with cute and fuzzy, or so I hoped. And, that's about the only explanation I have for the insanely long poem that follows. Peter Cottontail was a busy guy. After all, he was a skilled and dedicated P.I. Peter Cottontail would get to the root of the problem. From a mom with a girl who was quite forlorn. And hid for the girl two dozen eggs no bigger than a mouse. A mysterious problem had arisen, though. There were not twenty-four eggs to be found, no! And the girl was really just about to lose her mind. "Please, Peter Cottontail, P.I.," the girl's mother did say. "Could you help us find the missing egg on this fine Easter day?" And he intended to help the sad girl using his sleuthing talent. Who currently happened to be the mother and her girl who did lament. So Peter Cottontail turned to other options he could inspect. And it sure had a loud and lively bark. "Do you know anything about a missing egg?" The dog wagged and wagged its tail as Peter Cottontail walked up. It skipped and trotted and let out a series of ruff, ruff, ruffs. "Hey! Hi! Hey! Do you want to play ball?" And that was all Peter Cottontail got out of the dog. Peter Cottontail highly doubted the dog was using a ploy. Peter Cottontail then noticed the cat in the same yard. It was basking in a sun ray not far. But was interrupted by the cat who said, "Back off, young man. I have been enjoying this sun ray for hours on end. I know nothing of an egg, so find someone else to offend." Before long, Peter Cottontail caught sight of a little brown wren. When it popped out of its little birdhouse of a den. "Do you know anything about the Easter Bunny's recent task? And one of them seems to have disappeared into thin air." "All I know is that girl's cries could wake the dead." Peter Cottontail determined the bird was a bit rude, but not a guilty guy. Peter Cottontail, P.I., looked around for clues to come into sight. What he saw was a squirrel sprinting across the yard. The little fellow stopped before he got very far. Which he then held up and gave a mighty long smell. Then the squirrel bent over and dug a hole in the dirt. He threw the peanut in, buried it, and looked around, alert. "Excuse me, squirrel," Peter Cottontail, P.I., said. The squirrel shrugged and answered, "Maybe." "It was a yes or no question," Peter Cottontail did say. "I've seen a peanut," the squirrel told the P.I. "But I can't tell you where, or why." "I'm merely looking for an egg that belongs to that there sad little girl." The squirrel scratched its head and asked, "What does it look like?" "Like an egg," Peter Cottontail did enlight. "It's an Easter egg, and will look quite pretty and nice. Has any such thing been seen by your two eyes?" The squirrel darted a few feet away and began to dig. From the hole he made, he pulled out a twig. The squirrel asked, "Is this it?" "No," Peter Cottontail replied, "I am not looking for a stick." The squirrel tried out another part of the yard. He dug and dug, leaving the yard quite scarred. "Is this it?" he asked as he pulled out the head of a doll. Peter Cottontail cringed and said, "No, no, most definitely not." After he'd finished his most recent digging task. He held in his paws a rusty old platter. Peter Cottontail was beginning to see a pattern. "No," he said, "but do show me what all you've buried today." The squirrel scratched its head in a less-than-promising way. And then he pulled from the dirt a perfectly inedible stick of butter. Peter Cottontail, P.I., finally found himself in luck. Where he first dug up an empty milk carton. But, after that, what did the squirrel pull from the dirt beneath a hedge? Why, of course, the sad little girl's Easter egg! And then he returned the pretty purple egg to the little girl. She clapped her hands and was no longer sad. After that, a happy Easter was had. As we've said over the past couple of weeks, since we share our A to Z Challenge doodles Monday through Saturday, we'll share our illustration for this poem on Sunday. That times out well, as it will be an Easter doodle, and Sunday is Easter. Fortuitous, huh? 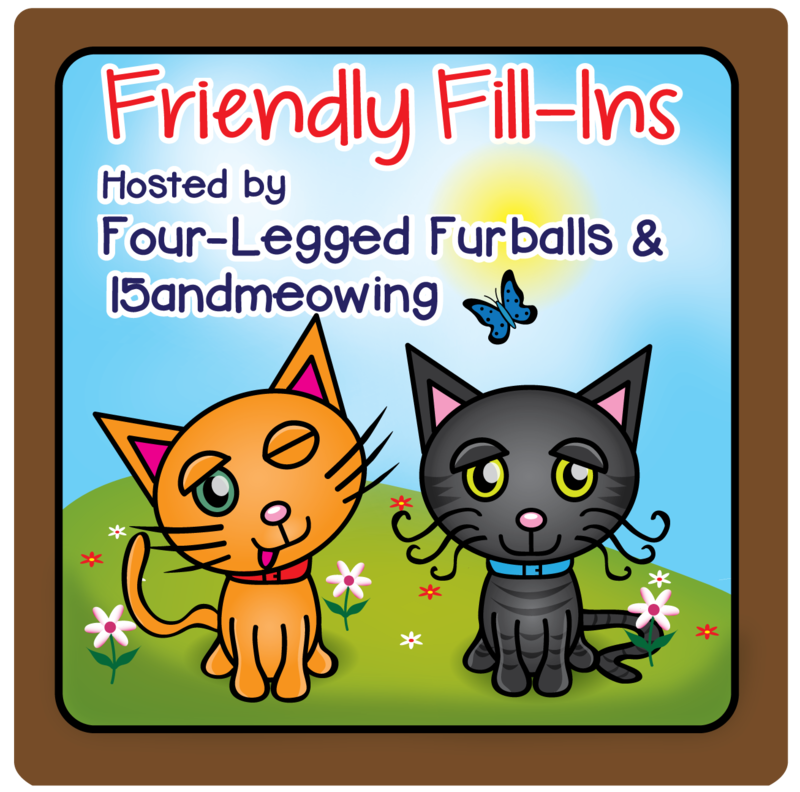 Last but not least, we have for you the fill-in statements for tomorrow's Friendly Fill-Ins challenge. Ellen of 15andmeowing crafted up the first two, and I came up with the second two. 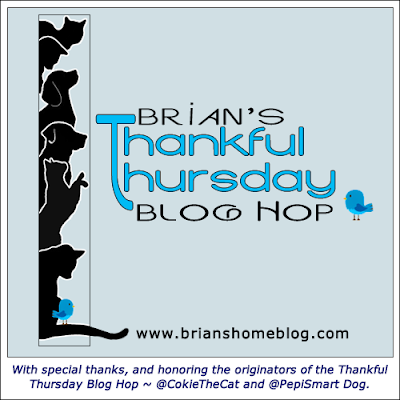 Today's tip is about none other than vet bills. We're specifically going to mention some ways to help ensure that you can pay the vet bill. First, you can consider researching and purchasing pet insurance. As you all certainly know, pet insurance can help cover the costs of your furbaby's vet care. When pet insurance is not an option, though, perhaps due to the number of cats and dogs you have or due to your furbaby's particular health status, there are still other options to help you pay for you kitty or pup's vet visits. For example, you can look into Care Credit. Care Credit is essentially a credit card that can be used at certain veterinary clinics and which allows you to make payments over a few months or so. 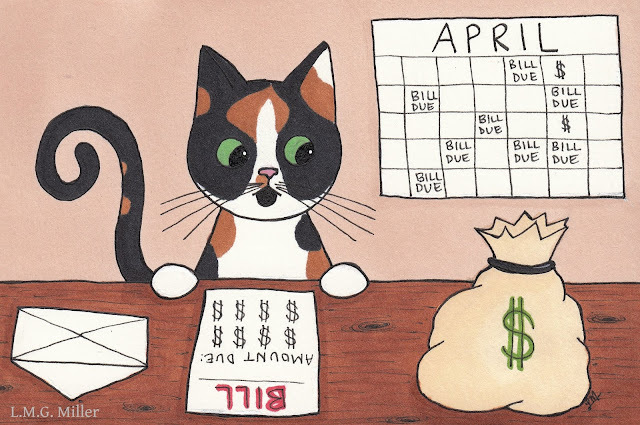 Similarly, certain veterinary offices offer their own payment plans, allowing you to pay for your cat or dog's care over a longer period of time. These payment plan options can especially come in handy for more expensive visits, such as those involving surgery or extensive diagnostic testing. So, if needed, don't be afraid to ask your veterinarian what types of payment plans they offer. This all being said, if none of the above are options for your particular situation, then manage your finances in a way that includes your furbaby and their care. When you budget and save, keep your furbaby in mind. 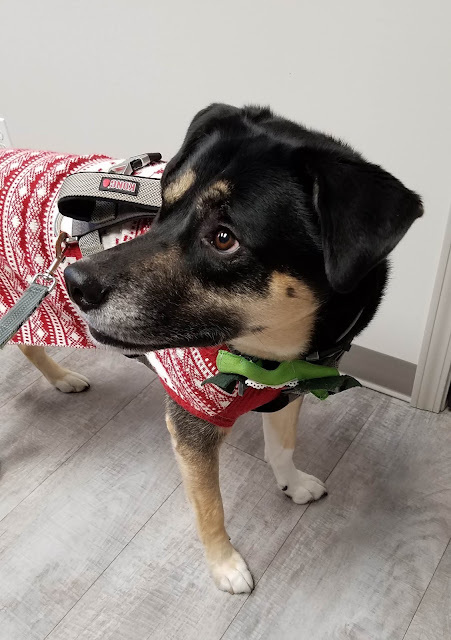 If need be and if possible, have a savings or other account specifically dedicated to your furbaby's care, and save even small amounts of money to put in that account regularly. Raising furry children is not often cheap, but there are ways to more easily pay the vet bills. It's still April, in case you hadn't noticed. What does that mean? That means we're still happily making our way through the A to Z Challenge! We're working through our alphabetical series of doodles starring my angel Rosie. In this series of doodles, Rosie is going throughout a more or less routine sort of day, doing this and that, A to Z style. So, what's Rosie doing with the letter O? Throughout this A to Z Challenge, we're also going to do our best to share furbaby photos that in some way correlate with angel Rosie's daily alphabetical adventures. 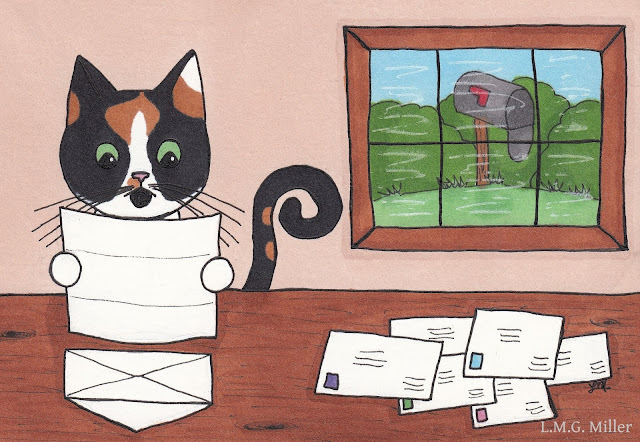 To go along with today's A to Z topic of Opening the Mail, Thimble wanted to share a flashback starring her favorite sort of mail. Boxes! When we receive boxes in the mail, we all get excited. But, Thimble is curious, do any of you ever find anything like this crawling out of your boxes? Perhaps that's just a sight here at our house? We're wishing you all a wonderful Wednesday filled with boxes! Today's tip is to make sure that your cat or dog's veterinary office always has your current address. This can go for both your mailing address and your email address. Most veterinary offices will send physical mail and/or an email when your kitty or pup is coming due for their annual exam, vaccinations, followup tests, and so forth. Life can be hustling and bustling, so getting reminders regarding what your furbaby is due for, and when, can be very helpful for ensuring their health. In addition, some veterinary offices also send out mailings regarding sales on products or services, which can also of course be beneficial to receive. So, make sure that your veterinary office has your up-to-date address, and also make note of and schedule any necessary veterinary services for which you receive a reminder. Also related to this topic, make sure that your veterinary office has your up-to-date phone number, as they might also call with reminders or important information. If your address or phone number changes, let your veterinary office know, and pay attention to important messages you receive from them. Here we are with another installment of the A to Z Challenge. Our contributions to the A to Z Challenge this time around are a series of doodles starring my angel Rosie. In this series of doodles, Rosie is going throughout a more or less routine sort of day, doing this and that, A to Z style. So, what's Rosie doing with the letter N? Throughout this A to Z Challenge, we're also going to do our best to share furbaby photos that in some way correlate with angel Rosie's daily alphabetical adventures. To go along with today's A to Z topic of Nap Time, Evan wants you all to know that it's okay to stop and drop for a nap whenever and wherever you need one. He often helps out this mom of his while she's cooking in the kitchen or doing laundry. If such snoopervision tires him out, he immediately stops for a nap. Here he is settling into his favorite bed for a nap by the dryer. Today's tip relates to being cautious when near napping furbabies. Especially when it comes to deaf or skittish pets, be careful not to scare them when they're napping, such as by unexpectedly petting them. When napping and deep asleep, some dogs or cats might even display fear aggression if woken unexpectedly, which could result in even an accidental bite or scratch. As needed, if you need a sleeping cat or dog's attention, or are approaching them when they're sleeping, say their name first, or make another sound that is not alarming. Not all pets will be alarmed when awoken by a hand petting them and the like. You know your furbaby and their behaviors best. To be safe rather than sorry, though, especially if around an unfamiliar cat or dog, or if a particular cat or dog is on the skittish side or is growing older or deaf, then perhaps do try to avoid petting them while they're sleeping so as not to alarm them, and to avoid the risk of a bite or scratch. Let's start today with something very, very important. Those of you who visited us yesterday might remember what we told you today is. That's right, it's my momma's boy's birthday! My Evan is 6 today. I try not to let that number scare me. I still remember when Evan was just a kitten. I remember when someone dumped 6-week-old Evan at the front door of the cat clinic where I used to work. I remember how the tiny kitten that he was hissed and growled at me. I remember seeing his little paralyzed hind legs and wondering if this little boy would even survive. Well, my boy survived all right. That feisty little kitten survived, and he won my heart. Happy birthday, my little hero! On Evan's birthday last year, I told his whole story. My boy's story is a very special one, at least to me. If you'd like to read it and learn more about my little hero, click here. 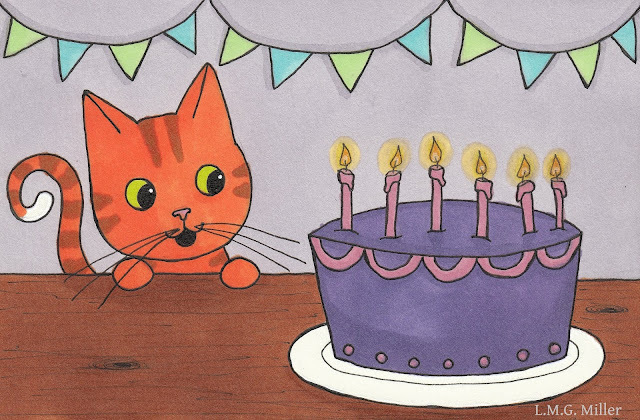 Now, go right on ahead and grab a slice of that birthday cake! We've got some catnip brownies coming out of the oven, too. Don't forget to visit the toy table as well, and to take a nap in one of those boxes in the corner. We're all about a wild and crazy party like that. Now, don't worry, because we didn't forget about the A to Z Challenge. We're a broken record, as always, so we're still every day reminding you that our contributions to the A to Z Challenge this time around are a series of doodles starring my angel Rosie. In this series of doodles, Rosie is going throughout a more or less routine sort of day, doing this and that, A to Z style. So, what's Rosie doing with the letter M? Throughout this A to Z Challenge, we're also going to do our best to share furbaby photos that in some way correlate with angel Rosie's daily alphabetical adventures. To go along with today's A to Z topic of Making the Bed, the birthday boy himself is showing off what a huge fan he is of fresh beds. He especially likes his beds straight out of the dryer, warm and toasty. 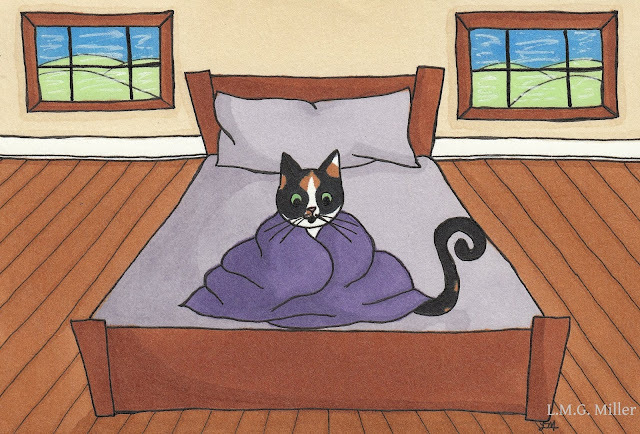 Today's tip is to make sure that the number of beds, blankets, and other napping places in your home is proportionate to the number of cats, or pups, in the house. Even with one cat or dog, a variety of sleeping spots can be important for a furbaby. This is even more important with multiple furbabies. This is because, just as with humans, cats and dogs sometimes simply want some personal space or alone time. Make sure these multiple napping spots are spread throughout the house, rather than crowded in one area. Especially for cats, also make sure that these rest areas are at a variety of heights. Cats often enjoy vertical personal space, so homes with multiple cats can do well having cat trees with multiple levels, as well as pet beds and blankets on beds or couches as well as on taller shelves or other elevated surfaces. The long and short of it is that when you have multiple furbabies, make sure they all have options for cozy places to have a peaceful nap. Personal space is important for our furbabies, too!